Good Morning — I’m Stephen Woessner, CEO of Predictive ROI and your host for Onward Nation. I’m excited to share today’s episode with you because my hope is that’s going to helpful to you in a couple of different ways. This episode loops back and connects with the video we aired last week on our Predictive ROI YouTube channel where I shared some insights around how to create content while you’re running your business. I know you’re busy. I know you have a compressed schedule. I know there are not enough hours in the day to lead your team, take great care of clients, devote yourself to your family, your community, and the myriad of other roles and responsibilities that are important and you want to show for as your best self. And through all of that…you’re being encouraged to create weekly, if not daily, cornerstone content that firmly plants your flag — your point of view into solid ground — which becomes your thought leadership — and to do that in such a way it drives revenue back into your business. Seriously…how is there possibly enough time in a day or week to get it all done? And yet it is possible — with the right framework in place. So in last week’s YouTube video — I took you inside one of my recent trips to Florida where I did something I swore back in Episode 1 of our video series that I would never do. I recorded a video in a busy hotel lobby! It made me so uncomfortable. But I had to. I had to get it done…and in doing so…my goal was to use my intense schedule compression as an illustration of how you too might be able to find pockets of time in your day where you could record a snippet or two that would be helpful to your audience. And in the process of you doing that — you give yourself an opportunity to take your audience behind the curtain so they can see what a day in the life of looks like for you. I get it — that may sound silly and not all that helpful — and if you’re thinking that — trust me — I was right there with you — up until a couple months ago. The feedback that I have received is that these types of behind the scenes peeks into the inner workings of Predictive ROI are helpful and our audience finds it interesting. And your clients might feel the exact same way if you give them that kind of look into your business, too. In last week’s video — I also recommended that you look for opportunities to slice and dice your cornerstone content so that one interview or video can be transformed and become a bunch of other pieces, which will help streamline the content creation process. And that’s the lesson I want to reinforce with you right now. This Onward Nation podcast episode was originally intended to be one of my solocasts where you and I would explore a topic with some real depth — but in the 11th hour — I changed my mind so that I could share an example that will hopefully be even more helpful to you. One…because I want you to see a practical and tactical example of how one piece of my cornerstone content — in this case — me being a guest on another podcast — can then be sliced and diced…transformed…and used as an episode on our own show. So one interview actually formed the foundation of two episodes — one for Onward Nation — the one you are listening to now — and one for The Athletics of Business podcast — whose listeners downloaded it last week. My point is…that same type of leverage is available to you and your cornerstone content, too. And when you give your audience an insider’s look to you as a guest on another person’s podcast, YouTube channel, blog, or some other type of content where your thought leadership takes center stage — you give your audience a different lens through which they can see and experience you. They experience you in a different way — maybe even learn something new about you from the questions the host or interviewer asked you…and so on. And…you also added more time back into your day because you simplified your content creation process. Of course, the episode you share has to be relevant to your audience — and if it is — you simply tee it up with a custom introduction as I am about to do here for the episode with Ed Molitor. And that brings me to my second reason for sharing the episode where I was a guest. I am sharing it because Ed Molitor and his show are awesome and the lessons from the discussion may be very helpful to you. Why as time passes, growth challenges in our businesses should get harder because we have to break through to new levels. 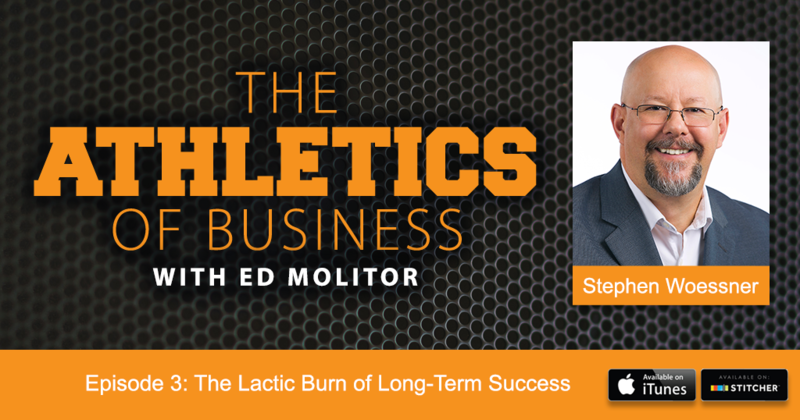 Okay…I’m excited for you to hear this episode…so here we go…Ed Molitor, the host of The Athletics of Business podcast…interviewing me. My hope is you will find some helpful business building and scaling insights within the conversation Ed and I had. But — as you listened…did the discussion also spark some ideas on how you might streamline your own content creation process? For example…say you’re a guest on a podcast — then you and your team could take the audio, transcribe it, and transform it into a blog post and a week’s worth of posts on LinkedIn. Or, maybe you’re a guest on the morning TV show in your local market — you take that footage, cut it up…add your own custom intro and outro to it — just like I did here for the interview I did with Ed — and then your 5-10 minute segment from the TV show becomes four episodes that you can air on your weekly YouTube series along with a Twitter campaign to drive views. Every day, you’re having phone calls, writing emails, giving interviews, contributing content to publications, meeting with clients, teaching workshops, giving presentations at your chamber of commerce and throughout your community, and the litney or other ways you serve. And each of those represent content creation, thought leadership opportunities that can be transformed into a YouTube series, a podcast, a blog series, and so much more. Create it once — then slice and dice your thought leadership — and your audience will have an opportunity to see you through a different lens than normal and because of the change in context, you may be that much more helpful to them in the process. And how is that not awesome!?! Please don’t fall into the mental trap of thinking that what you have to offer or to talk about is not that interesting, who would want to pay attention to you or your expertise. That’s the imposter syndrome creeping in. It is really easy to forget about the amazing, awesome, wonderful, beautiful things you do every single day — the things you could do in your sleep — why? — because that is your area of genius. So just when you think you are doing something “ho hum” — there’s someone else out there watching you, and when they see you do what you do, they think…Holy BANANAS — how did she do that!?! So don’t take yourself for granted, Onward Nation. Instead, let your audience see and when you do — you will move off that plateau and move your business to a brand new level…just like I talked about during my interview with Ed Molitor. So with that said…I want to say thank you. Thank you for taking the time to be here and thank you for your ongoing support of what we do here at Onward Nation. You sharing a portion of your 86,400 seconds you have today…means a lot to me. We appreciate all of the reviews on iTunes — and if you haven’t subscribed to our YouTube channel — please do — just go here.